Scan anything, anywhere. No computer needed! ultra-compact, autonomous and portable, the battery-powered iriscan anywhere 5 WiFi is the ideal device to get rid of any paper. 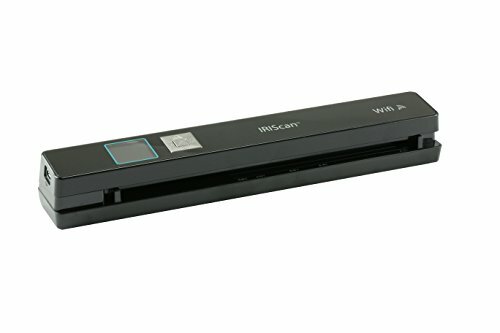 Perfect for scanning just about anything at home or on the go, it allows mobile users to easily capture documents, contracts, business cards, receipts and more, without a computer! just slip your document through the portable scanner; it is saved automatically into the provided microSD card and ready to be sent via Wi-Fi to all your mobile devices (smart-phone, Android tablet, iPhone, ipad) and to your PC or Mac. Once back at home or in the office, the scanned documents are automatically turned into editable files by IRIS' flag-ship OCR software read IRIS, allowing you to easily archive, edit and share them! fits perfectly any scan need of smb users & on the go actors, E.G. In the transport sector (bill of lading, delivery notes signature, etc), healthcare sector (prescriptions, Pharmacist drug list, etc) or for consulting tasks. Gain mobility while saving space on your desk!